Naples has always had a strange relationship with death and the afterlife. A visit to the catacombs might help understand the reason. 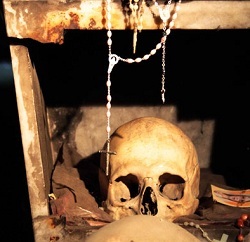 In the Neapolitan underground there are many examples of this type of burial, of some lost are the precise locations, many are not accessible due to poor condition or considered of little historical value and others are closed for bureaucratic reasons. 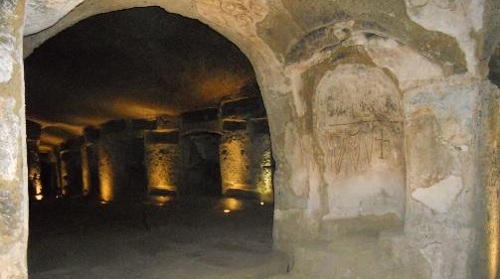 The typology of the Christian catacombs is one of the most common and rich in detail, especially architectural. They extend for several miles underground and consist of large tracts carved into the rock where the bodies of poor people were buried while the niches on both sides of the walls were used for those belonging to higher social classes. These niches, generally arranged in vertical rows (pilae), could contain one or more bodies. The remaining spaces located below the floor (crypts), were usually reserved for the bodies of whole families. They were, no doubt, carved by early Christians, and many symbols are painted on the walls. In some places the original fresco was covered with a layer of plaster, on which a second and sometimes third fresco was created. One of such places is the Cimitero delle Fontanelle (Cemetery of the little fountains, so called because of the many water springs in the area) located in the neighbourhood of Rione Sanità ("the Health Alley" ) adjacent to the Capodimonte hill, north of Naples Historical Centre. The cemetery was closed for a long time because banned by the Vatican. 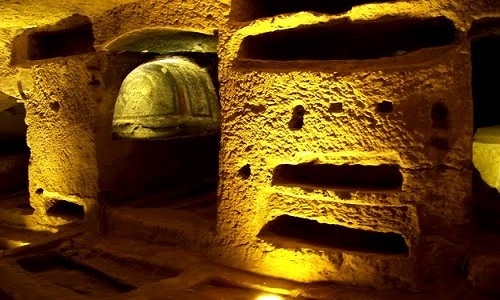 The location was a burial place in Hellenistic and Roman times, as witnessed by the discovery of Hellenistic hypogea and Paleochristian catacombs. 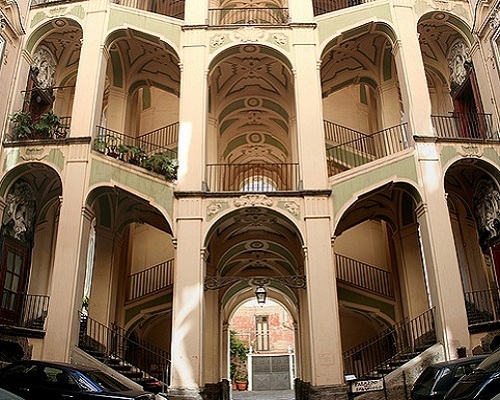 Considering the number of existing old palaces it is belived that the Rione Sanita' was originally established as a home for noble and rich families of Naples' aristocracy. The Fontanelle cemetery is an ossuary, located in a cave in the tuff hillside in the Materdei section of the city and the source of a fascinating chapter in t he folklore of the city. By the early 16th century, there was already concern over where to locate cemeteries, and moves had been taken to locate graves outside of the city walls. Many Neapolitans, however, insisted on being interred in their local churches. To make space in the churches for the newly interred, undertakers started removing earlier remains outside the city to the cave. The remains were interred shallowly and then joined in 1656 by thousands of anonymous corpses, victims of the great plague of that year. 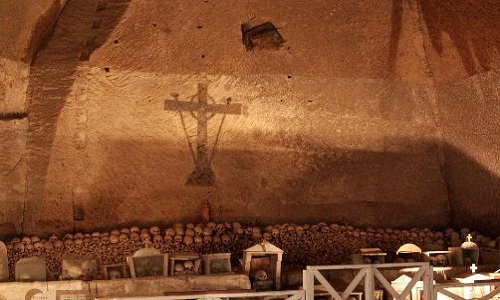 A unique and peculiar ritual and cult takes place in the ossuary of the Fontanelle cemetery and it all started (as tradition suggests) in 1872, when Father Gaetano Barbati had the chaotically buried skeletal remains disinterred and catalogued. The remains remained on the surface, stored in makeshift crypts, in boxes and on wooden racks and a spontaneous cult of devotion to the remains of these unnamed dead developed. Devotees paid visits to the skulls, cleaned them —"adopted" them, in a way, even giving the skulls back their "living" names (revealed to their caretakers in dreams). An entire cult sprang up, devoted to caring for the skulls, talking to them, asking for favors, bringing them flowers, etc. 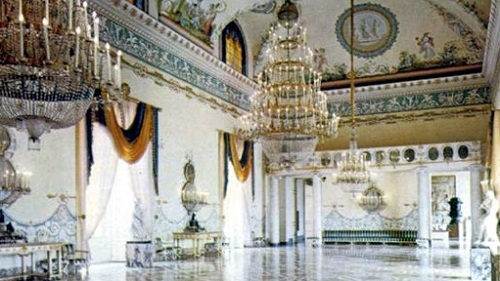 This practice continued for nearly 100 years until the Archbishop closed the cemetery in 1969 over growing concern the cult had become fetishism. The Fontanelle Cemetery suffered a long period of degradation, but after a major renovation project that started in 2002, the cemetery was reopened to the public in 2006. Only open for a few days each year, after a protest in 2010, the Fontanelle Cemetery was returned to the public on a full time basis. Nearby: the church of Maria Santissima del Carmine - Museo di Capodimonte, located in the Palace of Capodimonte. 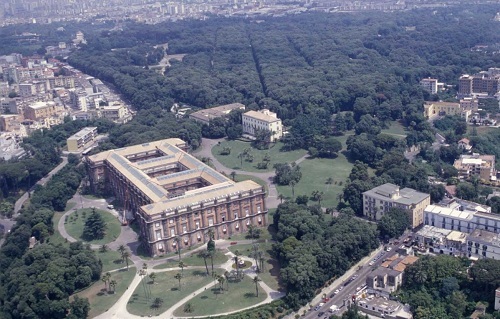 The museum is the prime repository of Neapolitan painting and decorative art, with several important works from other Italian schools of painting, and some important Ancient Roman sculptures.a grand Bourbon palazzo in Naples, Italy. With excerpts adapted from Napoli unplugged and Wikipedia. 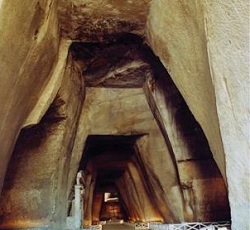 The catacombs of S. Gennaro is composed of two layers that do not overlap. The upper catacomb knew different stages of development: its origin is in the ancient tomb named "the upper vestibule”, known mainly for its frescoes of the vault of the late II Century. The main elements of the upper catacomb are the small "Crypt of the Bishops' and the majestic "basilica maior "(a true underground basilica). The former, located just above the tomb of St. Gennaro, is dedicated to the memory of the first 14 bishops of Naples, the latter is the result of extensive transformation of neighboring environments created when, in late V Century, was moved the tomb of St. Gennaro. The "basilica maior" has three naves, contains numerous frescoes (IV - VI Century) and is deeply cut into the stone. 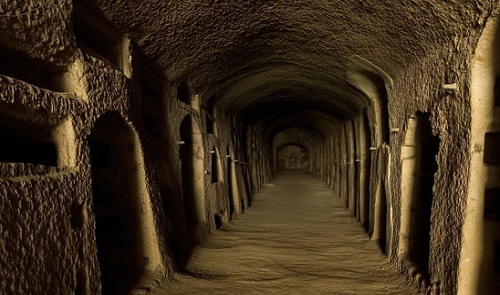 Catacombs of st. Gaudioso : From the Basilica of St. Mary of Sanità one can reach the catacombs of the African S. Gaudioso, who arrived in Naples in A.D. 439, because of the persecution of the Arian King of the Vandals, Geiseric. The translation of the relics of St. Gaudioso to the city (IX Century) caused the abandonment of the place until XVI Century, when an image of the Madonna and Child dating back to V-VI Century, was rediscovered. The image, which is the oldest of Naples, is currently in the Basilica. A distinguishing element is the burial of the dead skulls recessed into the walls of the ambulatory and the opening a new area below the catacombs, for the realization of so-called "seditoi", or "gutters", seats carved into the tufa on which the dead were laid to dry before being placed in an common ossuary or a private grave. On either side of the ambulatory open cubicles with valuable paintings arcosolia containing Christian symbols like the lamb, the peacock and grapes (V Century). For touring some of the churches and/or the catacombs please contact the social cooperative "La Paranza". The association : The social cooperative is composed of young peoples born in the Rione Sanità. Through the promotion of the Rione Sanità, its history, its art, its culture and, last but not least, its faith, we can begin the process of recovery that would allow the implementation of a revival of a highly deprived area plagued by sociocultural differences.